I don’t get it, but I live in Kansas. I bought my first house for under $100,000. But my brother lives near San Francisco and he probably understands this concept a little better. he couldn’t buy a shack for under $100,000. Hey Craig, it’s not just about the price, though even the most expensive custom-built tiny houses on wheels max out around $65,000, but most I’ve sen are between $20,000 and $30,000. It’s more about the freedom and mobility that living in a Tiny House can give you. Again, you can get a 2,000sf home here in Huntsville brand new for $100,000 in places as well – but what does that buy you? Just space, vinyl, cheap carpet and walls, a monthly mortgage payment, real estate taxes, insurance and the upkeep and cleaning of all that space. What if you could live twice, three times or more as well in a space that costs 1/3 to 1/4 as much and really live? 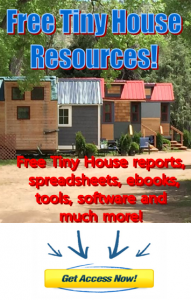 That’s what the Tiny House movement is about: freedom, mobility and lifestyle! Thanks for your comment! REALLY interesting topic and perspective, Hans. Thanks for sharing all of this info and your amazing videos! Thanks Amy. It’s a huge grass roots movement taking place and apparently Colorado is one of the more difficult places (laws, zoning, etc) to live that way. But I’m trying to change that! More to come on that topic soon… Thanks for your comment! These things are so stinking cute and practical. makes me wonder how I can get one over to Kauai. Maybe I just need to find land now and have one of these cuties. Regina, definitely. People are building them everywhere and much more inexpensively – what’s there not to like? More time, freedom and mobility! Thanks for your comment! Hey Jordania, we are looking to build Tiny House communities around the US so people can live this incredible, freeing lifestyle. Just go here to get more information and stay up to date. Thanks for your comment! Very interesting. Just bought 50 acres in Colorado and want something like this to spend weekends in till our house is built. Thanks! Hey John, a Tiny House may be a great way to go! Then when your house is built you’ve got your home away from home that you can take on the road with you to the beach or the coasts or to visit other friends and family – or have a guest house, ready to go. I think it is a great idea 🙂 I am planning a move in the next few months. My home will not be bigger then a tiny home but due to the location we chose to live I would not be able to drive a vehicle in to at the moment. No I’m not traveling but downsizing my living and foot print is exactly what I want. I’m tired of collecting stuff that ends up only in my way. I don’t need 5 recliners. If I want to be lazy I can lounge in bed. I don’t spend much time in most of my home anyhow and it seems the more space I have the longer I can go between doing a tidy. Thus more work when I do stop my life to clean. I don’t know why I have enough dishes to feed an army when we usually gather at a restaurant when friends and family visit anyhow. No I don’t need my fine china or trendy stoneware. I need function over fashion! I don’t want to get all uptight if someone brakes a glass or plate. I want to enjoy instead of worry over material items. I want to spend more time enjoying my husband and children then laboring over items that don’t even mean more to me then prestige. Bring on the simple life with good food, nice wine and wanted company! Out with the high maintenance image that doesn’t even suit me. Jamie, I couldn’t have stated it better. Thanks for sharing your situation and your perspective, I know a lot of people will get value from that. I think the “function over fashion” comes pretty close to summing it up!